Volume 2 of the ‘Rockhound’ series is now available. This particular volume focuses on the perception of value in mineral resources and the shifting lens through which Ontario’s mineral wealth is seen. In Rockhound: Opening the Treasure Chest we visit such old collecting classics as the Saranac Zircon Mine, Bear Lake, Grace Lake, Bessemer Mine and Kuehl Lake. 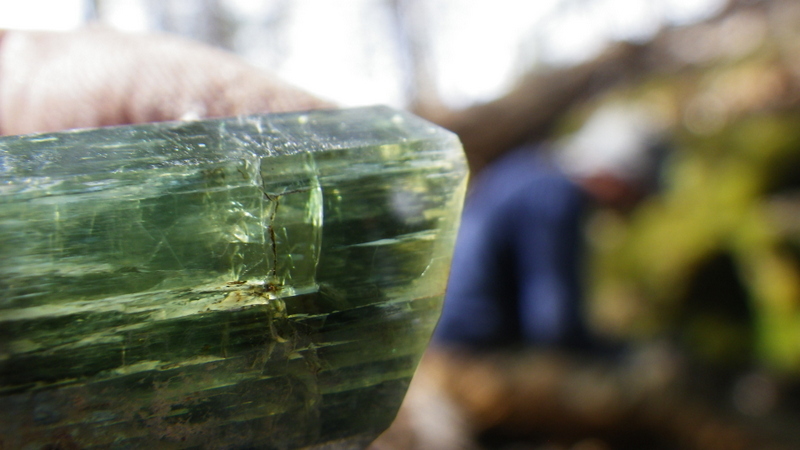 The mineral focus is on apatite, rare earths, tremolite, diopside and the more exotic treasures that are displayed at the Bancroft Gemboree. For any rockhound, mineral collector or crystal enthusiast this is without a doubt an invaluable accompaniment to a summer of collecting. Within ‘Rockhound’ you’ll learn how and where to collect. 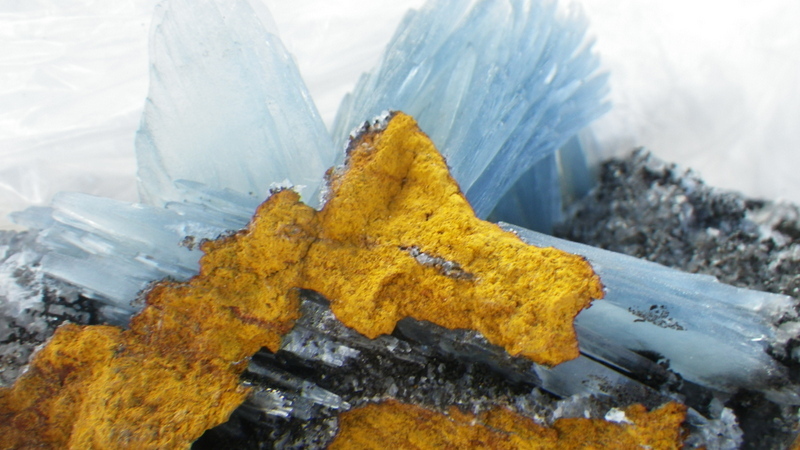 Over 80 mineral locations are detailed along with directions and specifics on the minerals found there. If you are interested in purchasing a copy or Rockhound: Opening the Treasure Chest visit the Lulu purchasing site here. I just attended the Bancroft Gemboree 2015, Canada’s largest gem and mineral show. There are 3 distinct areas where rockhounds can explore their interest, the curling rink and the hockey arena which are both indoors and the outdoors trading stalls. In my experience the trading stalls are the best places to purchase minerals. Dealers come from all across the country, they have incredible stories and the prices are phenomenal. Check out my youtube video on the Bancroft Gemboree here. Yes, that is indeed yours truly on the front cover. This is my latest book which is on rock and mineral collecting. As you can see its called ‘Rockhound: an Experience of the North’. This is actually the first of several books in the Rockhound series and it consists of several chapters detailing how to find minerals, identify minerals and the human experience related to that. This first book covers finding gold, feldspar, radioactives, sodalite, apatite, titinite and silver. As it says on the back cover “In this first volume of rockhound we will explore the mineral world in the context of the whole experience – the deposits, the landscape and the people. whether you are a hard-core collector or a casual enthusiast ‘Rockhound’ will take you to where you want to goand show you what you never believed possible in the mines and forests of the north”. If rockhounding interests you check out the preview of my book right here – click for a review of Rockhound. Well as you’ve probably gathered by the above picture, I’ve just discovered some pretty incredible mineral specimens – a pocket of gem quality tremolite at the contact between quartz and calcite veins. Tremolite evolves to actinolite under the right conditions, and sometimes changes to diopside. 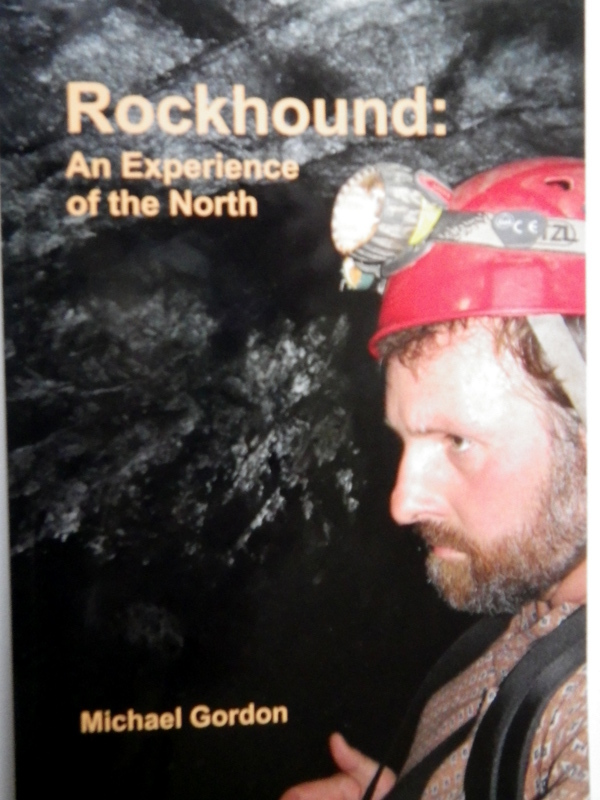 Anyway, the finer points of the discovery are detailed on my youtube site (caver461) and within the video details are provided for the purchase of my latest book on minerals – ‘Rockhound: An Experience of the North’. In the book I detail how to find gemstones and something of the experience of finding rocks and minerals in the north. To see purchase details or for a preview, just type the book name into Google and click on the link, it will take you directly to the print company (Lulu), or click this link here for immediate access to the book on Lulu. snogof, originally uploaded by Mic2006. This past weekend Jeff and I visited a spot in the forest where we had found a tunnel this past summer. We had been trying to dig into the tunnel but the bugs were terrible. Now that the ground is heavily laden with snow there is no such problem – now its the cold. Anyway, after about 4 hours of digging and levering frozen boulders we managed to create a hole large enough to look well into our suspected cave and what we saw within was an elliptical shaped tunnel that was plugged by boulders. A small waterfall dropped from the roof of the tunnel and beyond, a chamber in marble. See video for Snowgof – breathing tunnel here. We are yet to access the chamber, but with great difficulty Jeff photographed a small segment of the chamber. In his picture you can see a wall of pure white marble and you can hear the water falling within. Near the entrance the roof is encrusted with frost thus indicating airflow from deeper in the earth. In fact it was the smear of frost on the wall outside the cave that first got us digging there in earnest. Based on its proximity to the edge of a steep slope and no apparent resurgence at its bottom I am left to conclude that the water flowing into the cave must be dropping down deep quite quickly. I suspect that it goes down a shaft such as you see in Twin Trickles Cave. Spring will reveal what lies beyond. Embryo2, originally uploaded by Mic2006. 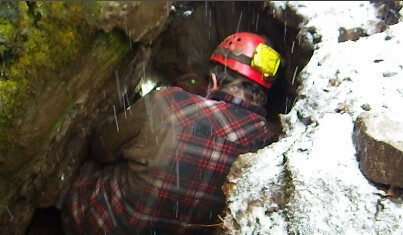 This past weekend Rob, Jeff and I visited Embryo Cave with the intention of digging out something of the earth plug at the lower end of the cave’s main stream passage. lying pressed between the rock and the dirt it was an experience from which I was unable to shake the feeling that it was as though we were returning to mother earth. We dug for some time in the earth as we suspected that in breaching an earthen crest up ahead we would possibly break into tunnel that led onwards and downwards. There appears to be a lower water filled level in this cave. The flowing stream bubbles up in sand part way along the main trunk passage and it sinks again just short of the earthen plug. Sadly we tired before we got through the dirt, but it was close and next time we visit we will certainly complete the job. IMGP7322, originally uploaded by Mic2006. Jeff and I made a recent reconnaissance in the Wasteland Waterway Cave system as we suspected that with the filling of the Blue Barrel sink, the cave passages had been blocked and so the deeper reaches of the cave system would now be sealed forever. But nature is more persistent than that and the sink had cleared itself out from beneath. On the surface there is a slight indent, but below the tunnel is perfectly clear. 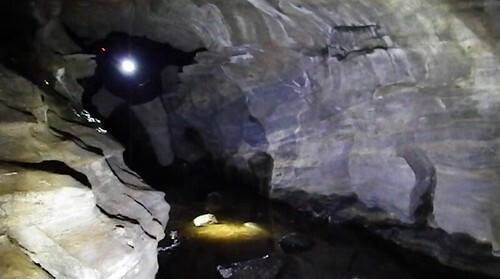 see the video of Cave exploration in Canada – Wasteland Waterway here. I suppose this now brings to light the question as to when we are going to push the tunnel to its very furthest endpoint. We strongly suspect that beyond the ‘gulch’ and the aerofoil the tunnels get bigger again. You ask what is stopping us? It’s a long cold crawl and a tight squeeze at the end of that which makes me somewhat leery.